With all the many products on the market today, there is no reason to have a plain gray concrete floor finish. A stamped concrete installation allows you to create natural-looking patterns and colors in the concrete that mimic natural stone or wood flooring. Special tools used in stamped concrete finishing make it possible to repeat patterns across the concrete slab. Concrete stamping is the process of creating a pattern onto unset concrete. You can do this when you pour a concrete slab. This is most common for new construction. Another option is to pour a thin concrete overlay over an existing slab. To do this, some overlay products require you to build forms around the edges that raise the slab’s surface at least 1 inch. In most instances, 3/8 inch is standard. Other overlays are self-leveling and may be as thin as 1/32 inch. As the concrete sets enough to hold the stamped pattern, stamps are set into the concrete. Once the concrete dries completely, you might opt to install grout in the lines created by the stamped pattern to give the concrete even more of a natural stone look. Press grout into the joints and wipe off excess, just as you would with a tile installation. A jointer tool can help you create a smooth mortar joint. While some concrete overlays allow you to mix the color directly into the concrete, many of them use powdered colors. These colors are scattered across the surface of the concrete while it is still wet. Because the color application is random, you get variations of colors much like natural stone or wood. As the color soaks into the wet concrete, it becomes darker and more vivid. It takes less dry color to achieve the colors you want than if you add the color directly into the concrete mixer. The dry colors also make the surface of the concrete harder. Typically, a 4-inch slab has a hardness rating of 3,000 to 4,000 pounds per square inch (psi). Adding a hardener either to the top of a slab or an overlay increases the psi rating to 7,500. Stamping tools are either a hard metal plate attached to a pole or 2-by-4-foot flexible rubber pads. Powdered colored release agents sprinkled on the tools before stamping allow you to press a contrasting color into the concrete for more color variation. The colored release agents also keep the tools from sticking in the almost-set concrete. Stamping tools are available for purchase, but they may be expensive. Another option is to rent the tools at a rental agency or home improvement store. A thin coating of concrete sealer creates a sheen on the finished concrete, plus it gives it a layer of protection from the elements. Sealer is especially important if you added grout to the joints as it helps keep the grout lines clean. When the concrete loses its shine, reapply sealer. If your concrete floor is inside, you can seal it with floor wax or polish. To keep the floor looking its best, keep it clean by sweeping it with a broom. Occasionally rinse it off with a garden hose. Avoid using deicing salt on the stamped concrete as it might leave pockmarks or holes in it. Common Questions about Stamped/Colored concrete. What color and stamps are available? Our inventory varies and many times if we don’t have a particular stamp we are able to rent and/or purchase them. Please contact Tim or Lance to see what is available. We leave the color up to the customer. We order prior to the day of your job. In some cases, special colors require a special concrete mix which is not available in our area. This is doable but at a much higher cost. Take a look at our color chart. Why is stamped concrete better than decks and pavers? Cost maintenance and number of design choices are the three main reasons. Decks need a lot of care and commonly at a higher cost. 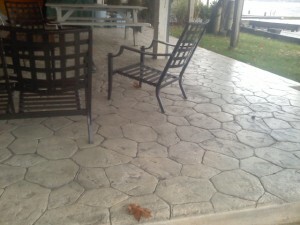 In most cases stamped concrete needs little maintenance and are rather unique especially when given the unlimited potential of design choices and colors available. Pavers also require much maintenance and offer a higher cost. In our climate pavers have a habit of rising and falling in the frost cycle. This rising and falling leaves a patio or walkway with humps and bumps that need to be reset. Another paver problem is that they often start to grow grass and weeds between the blocks. Lastly you may see fading to the blocks of your paver patio. You won’t find any of these three problems with your stamped concrete project. How much maintenance does my stamped patio need? 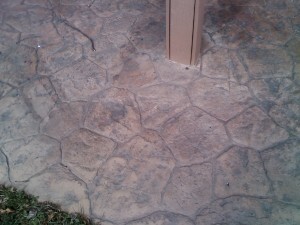 Your stamped concrete can be cleaned with mild dish soap and a hose or just sweep off. It is recommended in the western New York climate that you seal your stamped concrete every year to help control damage from salt and corrosion. Concrete does crack. Following strict guidelines does reduce or eliminate the chance of this happening. That is why a proper base is placed under your concrete, followed by wire reinforcement, control joints and proper placement techniques. Caution should always be used on a wet or icy outside surface. Care and the use of an anti-slip sealer in most applications will greatly reduce how slippery the concrete is when it is wet. How will winter affect my stamped concrete? Winter should be no problem for your properly placed stamped concrete. You do not want to use salt, which will damage any concrete surface, kitty litter or sand are good alternatives. With colored concrete, the creative options and color choices are endless, making it possible to achieve the perfect look. Colored concrete can transform a room or patio from plain to spectacular. Also, colored concrete can be used to simulate the look of brick, flagstone, pavers, or tile. Not only is concrete coloring a beautiful design option, but it is also affordable and compatible with both new and existing concrete. My new colored concrete is much darker than your color card. Why is that? Fresh Concrete is always much darker than when it is fully cured and dry. (Even uncolored concrete). Wait at least 7-10 days until the new concrete has hardened and dried. If the concrete is on a wet sub grade or there’s underground water, it may stay dark for as long as it’s wet. Can you guarantee the color will match the color card? Unfortunately, Not. The final color is a function of the cement color, sand color, the amount of water used as well as finishing methods.